#1 Beach in the world by National Geographic Magazine. #1 in 'America's Best Beaches-2016' and 2017 by Dr. Stephen Leatherman, AKA Dr. Beach. This property is a 2 Bedroom, 2 1/2 Bath directly on Siesta Key Beach. This is a single family private home. Renovated in 2008, this spacious 2 Bedroom homes offers 2200 sq feet of living space on 2 floors. Features a large living room with surround sound stereo and Fios TV always with MLB baseball package for avid baseball fans. A large balcony off the main floor with dual sitting areas overlooking the beach and gulf. Nice modern kitchen, washer dryer area and 1/2 bath are all located on the first floor. The Master Bedroom is exceptionally large with a side reading/reading sitting room that has a pull out twin bed as well. A private balcony makes the mornings very quiet and secluded for our guests. The Master bath offers a large double shower area for two with Travertine tile. We also have other great Siesta Key properties if this one is not available. It is located about a 3 minute walk to Siesta Key Village (1000 feet) which is where all the shops, restaurants and bars are located. It is 10 miles to SRQ airport, an hour drive to St Pete Airport and an hour and 15min drive to Tampa Airport. Orlando is 2 hours North, Tampa/St.Pete 1 hour North, Miami 3 Hours south. Balmy breezes. Dolphins and manatees. Pelicans, egrets, osprey, seagulls and a variety of shorebirds. Walk the beach or stretch out in the sun. Play a game of tennis or volleyball, ride a bike, fly a kite…whatever you want to do. Our tropical climate makes every sort of outdoor activity available and enjoyable nearly year-round. Former Merrill Lynch Management Executive. Began building real estate portfolio in 1994, with houses, apartments,commercial office and NNN Leases. Moved into the Florida market in 2008. Resident of Siesta Key FL. Our family fell in love with Siesta Key during family vacations. Decided to have our 'own' home on the beach and also utilize it within our business model of rental real estate. We really enjoyed our stay here! It’s a beautiful, clean, oceanfront home. The views are breathtaking. My husband and I were able to relax and enjoy some quiet time away from all of life’s distractions. You would be making a big mistake if you did not stay here. 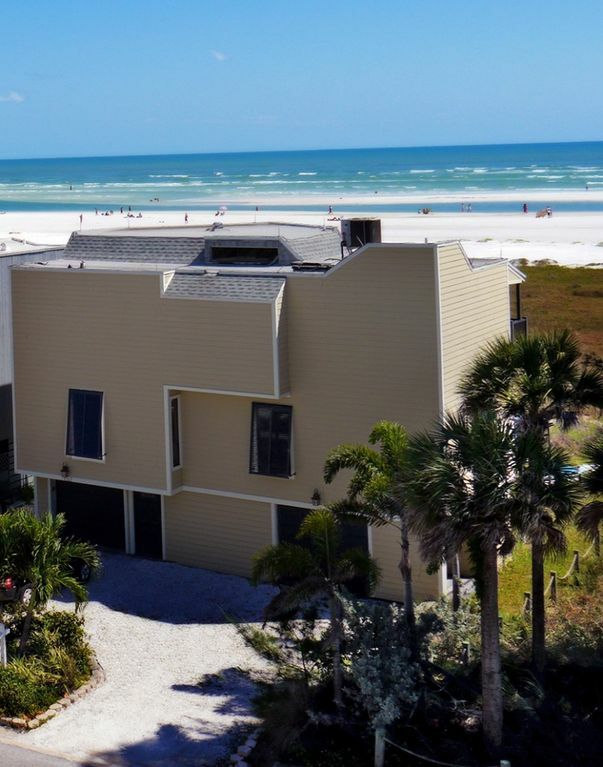 Super accommodations and maybe one of the best locations on Siesta Key. The views were spectacular. Next time we want to stay in SK, we would love to stay there. The decks were great , the weather was perfect! Ron had all kinds of beach chairs. He was very responsive. Great trip to the beach. My husband and I have vacationed at Christmas time in Siesta Key for almost 20 years. This property was by far the Best House on the Key. The layout is perfect, views are truly like pictures on website if not better. Ron was an amazing host that made sure everything was perfect. This house is perfect for family, or couples. Walking distance to The Village with shopping, food etc. We will be back multiple times a year. Nice house with an amazing view. Great place to relax and enjoy the amazing views. Multiple decks and a view of the ocean from most rooms in the house. Walking distance to the Village. This was our second time and it was even more enjoyable than our first time. The house was clean and contained everything one would need. Ron's attentiveness is one thing that separates this house from others that we have stayed in including his almost immediate response to any questions. Highly recommend!